Help take Trump to court to stop Keystone XL and prevent more oil spills: Donate $15 or more NOW! Today, TransCanada's Keystone 1 pipeline spilled more than 200,000 gallons of tar sands -- the world's dirtiest oil -- in South Dakota. This spill will contaminate the environment and threaten local communities. This is a sign of what's to come if Trump succeeds in forcing construction of TransCanada's Keystone XL pipeline. Keystone XL would carry 830,000 barrels of the world's dirtiest oil every day from Alberta, Canada, to the U.S. Gulf Coast. We've taken Trump to court to stop Keystone XL. But it's going to be a long fight. We need to make sure we have the resources to win. Can we count on you? Donate $15 or more and help take Trump to court to stop Keystone XL! 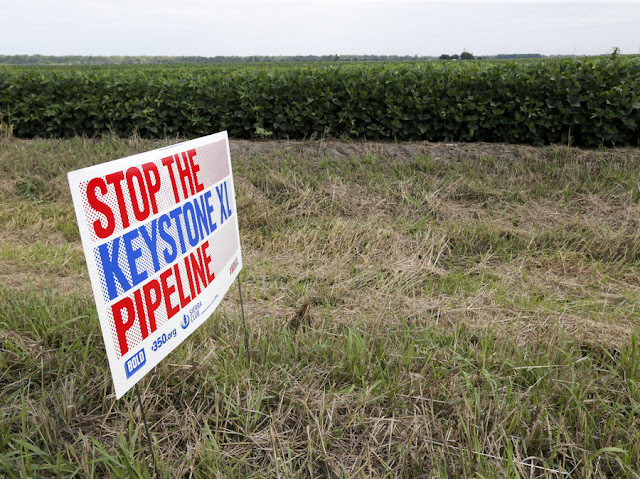 The Keystone 1 spill shows what's at risk if Keystone XL is built. The new pipeline would cut through the habitat of the critically endangered whooping crane. A pipeline disaster could put this important species at risk of extinction. Trump's attempt to build Keystone XL violates the law. Trump's State Department failed to fully consider the pipeline's impact on the whooping crane, which is protected under the Endangered Species Act. This is unacceptable. Trump and his administration are trying to get around their legal obligations just so they can hand this pipeline to TransCanada. But with your help, we can stop them. Donate $15 or more and help keep up the legal battle to stop Keystone XL! Trump is trying to make it easier for Big Oil companies like TransCanada to put our air, water and climate at risk -- all so they can make more profits. The evidence is clear: pipelines like Keystone 1 and Keystone XL are dangerous. They pollute our communities and threaten our wildlife. And they bring us closer to climate chaos. We're pulling out all the stops to prevent Trump from handing over our environment to TransCanada -- but we can't do this without you. A donation of $15 or more will help us stop Trump's attacks on our planet. Donate now and support the environmental resistance to Trump! © 2017, Friends of the Earth. All Rights Reserved.